My brother has been a vegan for two years now and it has inspired me to look for alternative and different ways to tweak recipes to suit his diet. I remember searching everywhere, concocting tasty vegan meals when he stayed with me for a week, and this recipe was one of the ones I used. Previously, when I made the Green Beans from Genius Recipes by Food52, I opted out of butter and used vegan margarine instead. Shockingly it turned out to be great surprise: it was one of the best green bean dishes I've ever eaten. 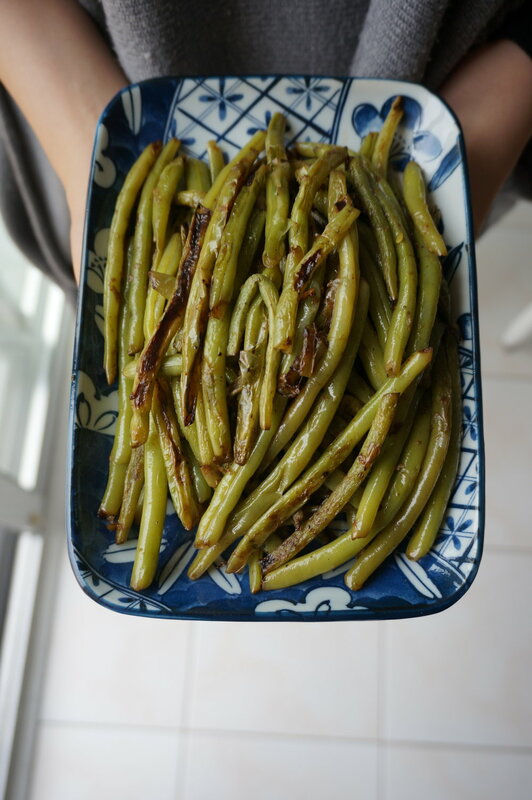 Fast forward to now, when I made these Green Beans again, I thought it would be nice to follow the recipe exactly this time thinking it would taste even better without any substitution. WRONG. It ended up being too buttery and it overpowered the entire dish. Don't get me wrong, it was still very tasty but it was better the first time or may I say, sometimes it is better the vegan way. Moral of the story: playing around with recipe or substituting ingredients isn't always a bad thing. Oh and remember to keep a pot lid nearby, unlike us. We were frantically searching for one for 10 minutes, and ended up using a lid that didn't fit. See our hack below!